Research has proven time and time again that cows prefer something more comfortable than concrete, who doesn’t? 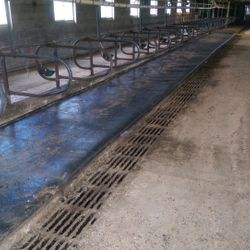 Do we really need any more statistics on it than looking at a barn full of cows with comfy mats that are all laying down? Cows are at their most efficient when they are comfortable and stress-free. 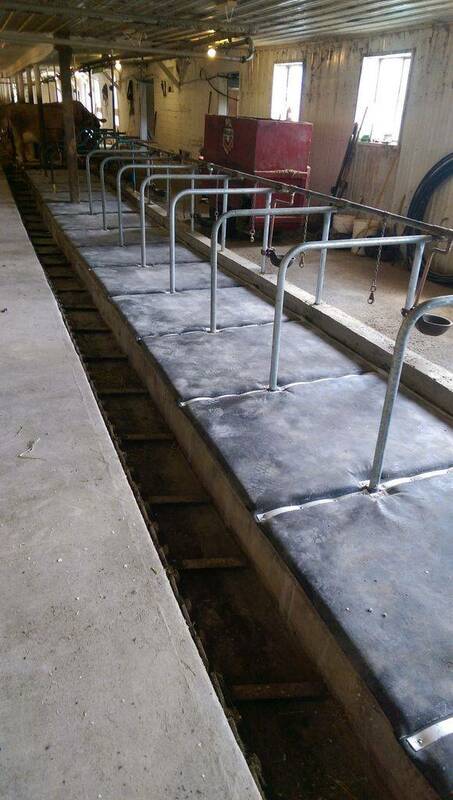 It has been shown through scientific research that cows yield more milk when they are in an environment that they are happy in, so if you’re a dairy farmer who relies on the milk your cows produce to pay the bills, you will increase productivity with quality cow matting. Your cows spend a large portion of the day standing up, and this generates a huge amount of stress and strain on their hooves and joints. Cow matting helps to reduce this significantly, providing a stable and comfortable surface for them to stand on that offers great orthopedic support to your animals, not only helping to improve their well-being but also cutting your vet bills. 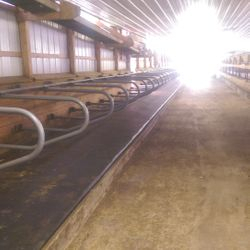 One of the major health implications of barns is the hygiene issues that can arise from large amounts of bedding. 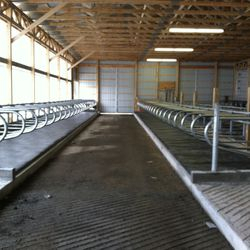 Sand bedding, for example, carries large amounts of bacteria and increases your cows risk of mastitis. 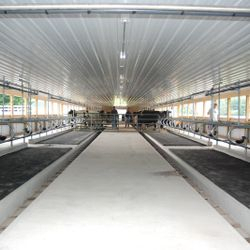 By installing cow mats, you will require much less bedding, allowing easier cleaning and thus a more pleasant living environment for them and working environment for you. With all types of matting available now, here is a description of the three best types to keep your girls comfortable and happy. The cow mattress system is the “tempur-pedic” of cow mats. 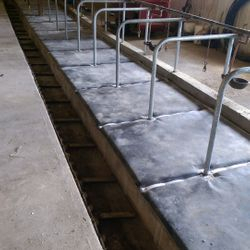 This cow mattress system achieves an outstanding balance of support and comfort. 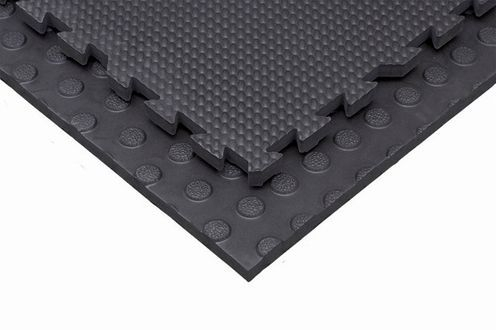 It consists of a PU-Latex constructed foam mat covered with a polypropylene covering held sturdy with 1/8” polyethylene strips and stainless steel concrete anchors. PU-Latex is a polyurethane-latex blended synthetic foam that is very similar in properties to memory foam. The polyurethane foam gives it the softness and the latex foam gives it the durability. The mats are secured into place and covered with an environmental grade polypropelene-fiber and polypropylene coated geomembrane covering. This covering is environmental grade strength and is used for many infrastructure industrial jobs. The mats are secured into place and covered with an environmental grade polypropelene-fiber and polypropelene coated geomembrane covering. This covering is environmental grade strength and is used for many infrastructure industrial jobs. To secure the covering, 1/8” thick strips of polyethylene (commonly known as manger liner) are laid along the sides and secured into the concrete with stainless steel concrete anchors. The exceptional shock absorbency of the foam mat gives this mattress system the superior traction and maximum comfort of the foam mat and the industrial strength flexible covering gives the mattresses the durability and easiness to clean, similar to that of rubber mat. Our Brown Cushion Mat is made up of EVA (ethyl vinyl acetate), which is the same thing that is used to cushion sneakers. This 4ft x 6ft mat is 1.25” thick and a lightweight 35lbs. This mat is thick yet lightweight giving maximum shock absorbency and superior cow comfort over the standard rubber. The increased flexibility of the EVA, as opposed to the standard rubber mat, gives the cows better traction in movement and comfort while calm. The mats have been treated to absorb shock but not liquids with a special top coat and this mat comes with a 3-Year Warranty. Our standard rubber 4ft. X 6ft. 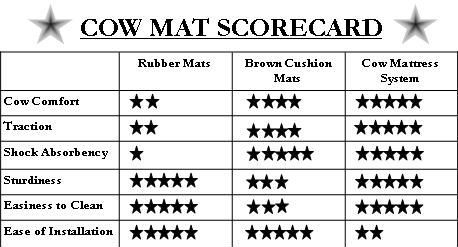 mats are 100 lbs each and available for many uses. 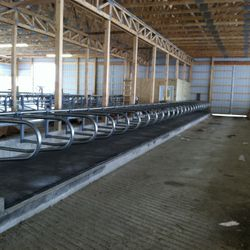 They are convenient in cow stalls, heifer pens, horse stalls, alley’s and parlors. 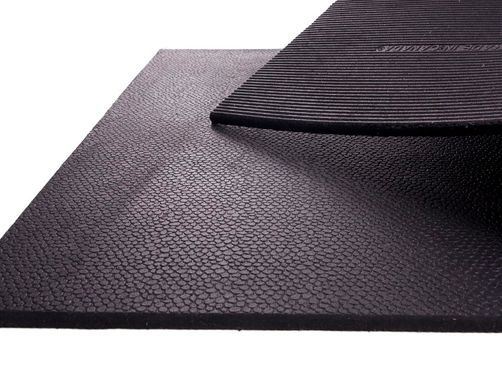 Manufactured from 100% recycled high-density revulcanized rubber, mats have an exclusive non-slip surface that doesn’t absorb fluids. Revulcanized rubber means that the rubber has undergone a chemical process to increase the durability. Regular natural rubber is sticky, deforms easily when warm, and is brittle when cold. In this state, it is a poor material when a high level of elasticity is required. After the rubber is revulcanized, it becomes waterproof, more stable, tougher and more resistant to heat, which makes it more useful for industrial purposes. This mat is very durable, easy to clean with equipment and keep clean and is best in high traffic areas because it can withstand the heavy loads and constant traffic best.